EFFICACITY We're Open Seas. A technology consulting firm founded on years of industry experience, strategic vision, and an obsessive commitment to customer service. Open Seas are specialists in business systems from around the world. As a bridge between customers and suppliers, we aim to find the best technical solutions to meet your business needs. We have the ability to offer software that meets your exact requirements, we offer solutions to best fit your needs. SIMPLICITY No call centres or telephone mazes. Just simple direct access to people who can actually help you. Our network of suppliers and resellers, backed up by our own team of experts and experience, will help to keep your systems up and running. - helping improve performance, efficiency, quality, and of course profitability. 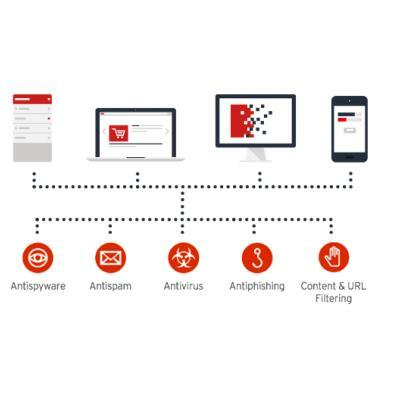 Trend Micro Worry-Free™ Business Security Services is hosted security software. You do not need to incur the cost of deploying and managing a server locally. Instead, the management platform is hosted and maintained in Trend Micro's in-house European data centre. This makes it very easy for you because Trend do the maintenance, enabling you to concentrate on your core business, saving IT costs. Open Seas or you can do the management & deployment. The security software is updated automatically. You do not need to schedule any resources or additional budget for this purpose. Whether it's on PCs, Macs, Android or iOS devices—Worry-Free™ Business Security Services lets you protect your data from online threats, such as viruses and spyware. For example, a special feature enables you to lock down Intuit Quickbooks’ files and folders, assuring you that financial and confidential business data is secure. Worry-Free™ Services also enables you to control whether employees are allowed to copy data from USB storage to their business devices, for example access can be limited to read-only. If you are concerned about certain websites reducing employee productivity, you can limit which websites your employees can access. websites certain times of the day, for example, block access to social media sites and sports pages at all times apart from working hours and lunchtimes. and wipe the device, therefore removing any sensitive company information. 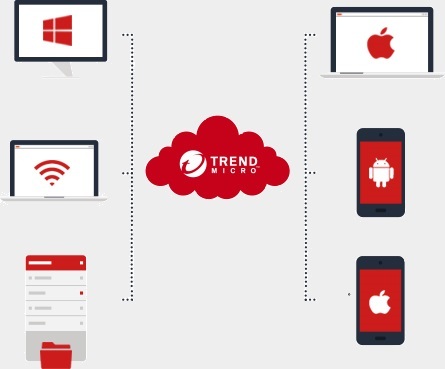 Trend Micro Worry-Free™ Services stops threats in the cloud, before they can reach your business’ network or devices, so your business is protected, but not slowed down. This is facilitated by Trend Micro’s smart protection network. Every day this early warning system gathers millions of pieces of threat data, analyses them and prevents threats from accessing your computer and infiltrating your business. Worry-Free Services is a SAAS solution which means that you do not need a server on your premises to host the software and all software updates and patches are done automatically by Trend Micro ensuring there is no maintenance required by you. Stops threats in the cloud – before they can reach your network and devices. Filters URLs – blocks access to inappropriate websites. Protects PC, MAC, Servers, IOS & Android Devices, Point of sale devices & USB drives. Prevents business data from being shared – via USB drives and with added protection to prevent data being shared via email messages. Safeguards against phishing as well as social engineering attacks. Provides you with easy security management. This site is owned and managed by Open Seas (UK) Ltd with Trend Micro content recreated with the express authorisation of Trend Micro United Kingdom & Ireland. Open Seas are an official Trend Micro reseller in the UK.